Others are busily using their gifts, and by their own efforts are successful in the eyes of the world. Maybe they have a thriving ministry. Maybe they are making good money. Maybe they have the respect and admiration of those around them. This doesn’t necessarily mean, however, that their actions are a blessing to the heart of God, or that they are even obeying what God has told them to do. Ecclesiastes 4:4 says, “And I saw that all labor and all achievement spring from man’s envy of his neighbor. This too is meaningless, a chasing after the wind.” Many are so busy creating their own kingdoms, that the kingdom of God suffers a great lack. Their pride and busy occupations have blocked the measure of their true worth in God’s kingdom. Who will fill these missing places in the body of Christ? Even now as we go about our daily lives, all creation groans in frustration, waiting for the sons of God to be revealed (Romans 8:19-22). There is so much work to be done, and so few who are willing to do it. John 4:35-36 says, “…. I tell you, open your eyes and look at the fields! They are ripe for harvest. Even now the reaper draws his wages, even now he harvests the crop for eternal life, so that the sower and the reaper may be glad together.” God intends both the sower and the reaper to share the same joy of the harvest. There should be no competition among God’s faithful servants, no jostling each other for the “prime” positions, no envy or personal ambition. If we truly love the Lord, our only goal should be to bless Him, to serve Him, and to advance His kingdom. So much of what we do for God is with mixed motives for our own personal fulfillment. We all want to have a purpose and reason for living. We all hope that if we were to die tomorrow, we would leave a legacy of some kind behind us. Yet for most of us, this becomes the end to which we live. Sadly, when we make anything other than God our reason for living, that thing will become an idol in our lives. Even if it is a good thing, like a ministry or a mate, it can still never fulfill us because it wasn’t designed to. It simply can’t! It doesn’t even have the ability to fulfill. In fact, those idols will begin to work against us, and cause us suffer spiritual barrenness. They will put us on a treadmill until we become broken-hearted and exhausted trying to keep it all alive. On the other hand, if we receive them simply as the gifts they are and continue to love God first in our lives, we will be given the ability to enjoy them, for this too is a gift. Ecclesiastes. 3:13 says, “That everyone may…find satisfaction in all his toil–this is the gift of God.” The key is simply to “seek first his kingdom and his righteousness and all these other things will be given to you as well” (Matthew 6:33). 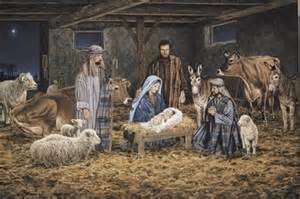 As we look around the world this holiday season, let us stop and consider Who’s birthday we are celebrating. Let us not forget to offer sincere thanks to our precious, precious Lord for His many blessings in our lives. And let us show our thankfulness by our actions! Let us offer the same mercy that God has given us to those around us. Let us press deeper into the heart of God, that we may have something to offer this world besides the same old cycle of greed, pride and rebellion. Let us not be ashamed to become the servant of all, showing our love for God by laying down our rights, our plans, our time and money for the sake of others. Let us demonstrate our love to God by giving Him the very things we are afraid to lay down, trusting that He has the best plan for our lives and would never use or abuse us. Let us truly fulfill the greatest commandment, which is to “Love the Lord our God with all our mind, soul, and strength; and to love our neighbor as ourself” (Luke 10:27). Each of us is destined to make a profound difference in the world. Let us not fall short of our destinies! Let us give the greatest Christmas gift that we have been afforded to give; one that we can give year-round – to bless the heart of God! If you do not know God the way you want to, you can receive the gift of knowing Him right now. Simply pray to Him from your heart and ask him to forgive you for your sins and turning your back on Him. Romans 10:9: “If you confess with your mouth that Jesus is Lord and believe in your heart that God raised him from the you shall be saved.” Ask Him to come into your life and make you a new person, born of His spirit. You can give to Him a gift He considers more dear than anything else in the world – yourself. In return, you will receive eternal life with Him, which begins the moment you are born again. May God bless each of you richly as you seek to give unto Him your all.